Confidence and ambition are key in the theatre. And not just when you are on stage. You have to show confidence and ambition in every aspect of theatre, especially in an educational environment where everyone has to pitch in to make the shows happen. Our theatre department has gotten significantly smaller in the last year. We lost the professor who taught costume design and the one student whose main focus was costume design graduated. At the beginning of the year we didn’t know who would be costuming our musical. My roommate, Amy and I, had been cast in the show and were doing a ton of research. One night we stumbled upon a 53-page dissertation about the costuming in this particular show. Of course we read the whole thing. So my position went from acting in the show to acting and doing dramaturgy to acting in the show, doing dramaturgy, and co-costume designing. Soon after, I was asked to do some choreography for the show since I have experience in that field. I was now in the show, co-costume designing, doing the dramaturgy and choreographing the show. Finally, during the second week of rehearsals, I was asked to work on the props design. My final list of duties for the show became playing the lead, co-costume designing, doing the dramaturgy, choreographing, and co-properties designing. Because I want to go in to theatre professionally, the theatre faculty find it important that I am getting this experience in multiple aspects of theatre. They also know that having this many jobs will not detract from any of the other jobs I am doing. They appreciated the confidence I had to take on the jobs and the ambition I have shown in getting them done. A group of actors sit in a circle in the middle of the stage. They are here to do the table discussion for an upcoming production. The director, Professor Taylor Clemens, leads the discussion with the usual questions. How does your character interact with this character? How long have you known each other? Was this your first serious relationship? But this table discussion has some very specific questions that these actors must answer. How are we going to address mental illness with respect? How can we make this character’s story seem real? The entertainment industry has historically been fascinated with the topic of mental health. This began in the 1930s with portrayals of Dissociative Identity Disorder (formerly multiple personality disorder) in Dr. Jekyll and Mr. Hyde. This has continued to the present day with the current onslaught of mental health-centric TV shows and movies released almost monthly. Even as this plethora of media is distributed to the masses this does not mean that the representation is no longer problematic. The representation of mental health disorders on TV, in movies, and on stage is a much debated thing on any arts and entertainment website you visit. Lists are made of the best and the worst representation. Sometimes even actors are blamed for a lack of realism in their portrayal, and the stigma of mental health is always brought up. In a time where the news and politicians like to blame mental disorders for any tragedy that they can’t blame on terrorists, how important is our representation of mental health and how can we make strides towards lessening a deep seated stigma? She is not alone in this belief. Many mental health professionals feel that although representation of mental disorders has progressed greatly in recent years, there are still more shows than not that get it wrong. Professionals believe that the ways mental disorders are presented further societal stigmas about how the mentally ill behave. “So many movies that involve violence and aggression often lazily use the cause of mental illness. For example, something like DID, Dissociative Identity Disorder, there’s so many movies out there where the mass murderer has multiple personalities.” Dr. DeClute brought up movies, such as 2016’s Split, where the villain is a “crazy” person. She says that they are parts of certain shows that do a good job. She believes that Parenthood does a good job of representing autism and Iron Man 3 shows what she believes to be a realistic panic attack. Representation of any group of people is important. Society is currently pushing back against a lack of representation that has been in the media for many years. In April 2017, Netflix introduced the #FirstTimeISawMe campaign that highlighted the importance of diversity in the stories we tell on TV and in movies. Netflix also has endless options of mental health-centered movies and TV shows, including their original shows The Unbreakable Kimmy Schmidt, where the title character shows signs of PTSD; Lady Dynamite, a semi-autobiographical show about Maria Bamford’s life with Bipolar II Disorder; and 13 Reasons Why, which centers on a high school girl with depression. What can be done to fix the representation of mental health? Dr. DeClute gave this suggestion “Stop being lazy and stop using mental health as an excuse for violence and aggression.” She says that the majority of individuals with mental health issues are going to be victims of violence. Though Meister thinks that there are examples of good representations, she hopes that the takeaway from these scenes is not that this is the only way this mental disorder presents itself. Because the purpose of media such as television and movies is entertainment, Dr. DeClute says more dramatized choices are the choices that these programs should be making. “They are trying to do it for entertainment. They want ratings for their show, they want people to watch them, and they are showing bits and pieces of issues and treatment and resolution. That’s good for entertainment and that’s the choices they are making.” However, viewers have to remember that these pieces of media are just entertainment. My full first name is Joey. That’s it. No, really. Just Joey. This is something that no one can ever get through their mind. I can not tell you how many times people insist that my name must be Josephine. It’s not. There are two different stories as to why I got my name aside from the reason that I use. My dad, Joe, tells everyone that I was named after him. My mom tells a different story. She said that she read a book in middle school, before she met my dad, that had a female character named Joey and she loved it and decided then that she would name her daughter that. I tell people that I was named after the dancer Joey Heatherton. You know, the dancer that stabbed her boyfriend with a knife. I chose to take that reason. My middle name, Nicole, is actually pretty common. There was another girl with the same middle name in my class all through school and a countless number of girls with that first name. It’s my aunt’s middle name and that’s why it was chosen. Volquartsen is probably the worst last name you can grow up with. No one can spell it. No one can pronounce it. So many times when role call is said in a class I know I am up next because there is a huge pause before the next name and the reader always makes the same face. When I had my first professional job in theatre my costume tags were labeled with the wrong name. They spelled it Valquartsen. My music teacher in school spelled in Vulgurtson in every program through high school. My great-grandpa still calls us the Volkswagons. There is a joke in the theatre department that I will be famous one day, but my name will not. The most interesting is when people ask me “how do you say this,” and I tell them they answer “well that’s what I would have guessed.” I have to wonder how many of them would actually say that. Role call is always an issue for me though. Not just because of the pronunciation, but because everyone expects a boy. In high school I never met another female Joey. I have since coming to college but it was a weird name where I grew up. One time at an overnight honor choir I was assigned to a boys dorm because they expect that I was a guy. My name is Joey Nicole Volquartsen. I am a girl. I have never met another girl named Joey. I am not a boy. Joey is the only name I have. People ask me if my name is Josephine. It’s not. No one can spell my last name. It makes me laugh how many different ways they spell it. Even my family members don’t get it right. A group of actors sit in a circle in the middle of the stage. They are here to do the table discussion for an upcoming production. The usual questions are asked. How does your character interact with this character? How long have you known each other? Was this your first serious relationship? But this table discussion has some very specific questions that these actors must answer. How are we going to address mental illness with respect? How can we make this character seem real? The representation of mental health disorders on TV, in movies, and on stage is a much debated thing on any arts and entertainment website you visit. Lists are made of the best and the worst representation, sometimes even actors are blamed for a lack of realism in their portrayal, and the stigma of mental health is always brought up. In a time where the news and politicians like to blame mental disorders for any tragedy that they can’t blame on terrorists how important is our representation of mental health and how can we make strides towards lessening a deep seated stigma. The topic of mental health has been one that the entertainment industry has historically been fascinated in. This began in the 1930s with portrayals of Dissociative Identity Disorder (formerly multiple personality disorder) in Dr. Jekyll and Mr. Hyde and has continued to the present day with the current onslaught of mental health centric TV shows and movies released almost monthly. Even as this plethora of media is distributed to the masses this does not mean that the representation is no longer problematic. “Mental health is presented in a more extreme form or maybe a more dramatized form in media.” Morningside’s on-campus personal counselor Bobbi Meister believes that even though movies and TV shows about mental health are good, they are not real life. “It’s still a drama. Some of the characteristics that are presented aren’t always done in a natural way.” She says that they are parts of certain shows that do a good job. She believes that Parenthood does a good job of representing autism and Iron Man 3 shows what she believes to be a realistic panic attack to those she has witnessed. She is not alone in this belief. Many mental health professionals feel that although representation of mental disorders has progressed greatly in recent years, there are still more shows that get it wrong. Professionals believe that the ways mental disorders are presented further a stigma already held by society of how those who have a mental disorder act. Representation of any group of people is important. Society is currently pushing back against a lack of representation that has been in the media for many years. This is a contributing factor to the sheer amount of characters and shows that show different sides of mental health now. Dr. DeClute says that it is important to have characters that accurately represent mental health issues and the issue should not be avoided. She believes that the mental illness should not be a character’s whole identity, just one other part of their identity. So what can be done to fix the representation of mental health? Dr. DeClute gave this suggestion “Stop being lazy and stop using mental health as an excuse for violence and aggression.” She says that the majority of individuals with mental health issues are going to be victims of violence. The most important point both women brought up is that consumers of this media should not take what they are seeing presented in the media as anything educational about mental health conditions. “They are trying to do it for entertainment. They want ratings for their show, they want people to watch them, and they are showing bits and pieces of issues and treatment and resolution. That’s good for entertainment and that’s the choices they are making.” Because the purpose of media such as television and movies is entertainment, Dr. DeClute says that these more dramatized choices are the choices that these programs should be making but viewers have to remember that these are just entertainment. A group of actors sit in a circle in the middle of the stage. They are here to do the table discussion for an upcoming production. The usual questions are asked. How does your character interact with this character? How long have you known each other? Was this your first serious relationship? But this table discussion has some very specific questions that these actors must answer. How does the protagonist’s mental health condition affect your character? How are we going to address this condition with respect? How can we make this person seem real? In our current culture there are a number of different movies, tv shows and theatrical productions that focus on the topic of mental health. However, the representation tends to lean toward the worst cases of mental illness. Morningside’s on-campus personal counselor Bobbi Meister says that they tend not to show that mental health is a spectrum. Not everyone with a certain diagnosis will exhibit all the signs of the worst case that is usually portrayed in entertainment media. The genre in which these stories are presented also have an impact on the success of their representation. Horror movies, such as Friday the 13th and Psycho, are the worst for furthering the stigma because the murderer is a “crazy person” when in reality most people with a mental illness are not violent. If the scavenger hunt assignment in Intro to Journalism is my worst nightmare, this assignment surely comes in at a close second. Even though I am an actor, and it seems like this would go against every bit of intention behind becoming a professional actor, I have severe anxiety about talking to people I don’t know. Because of that I did use some people that I knew a little bit already or those that I was already being forced to get to know. 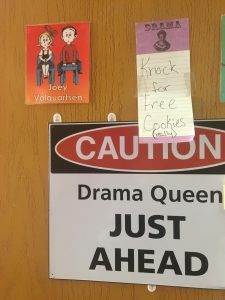 However it seems that I am a shady enough character that I still got some amazing reactions to the offer of free cookies. I gave away my first bag of cookies about five minutes after class ended. I walked back to my dorm room and my roommate, Amy, was there getting ready to head to her first class. As soon as I walked in to the room her eyes locked on my box of cookies and they didn’t leave that box for the entire time we were talking. She questioned me about why I had a box of cookies and when I told her she said, in a voice that sounded like the stereotypical child asking their teenage babysitter if they have games on their phone, “can I have one?” I thought about it for a second and then gave her one because at least that was one less person I had to talk to, even if I assume giving one to my best friend/roommate was against the assignment. The next day I had to do a number of fittings since I am acting as the costume designer for the next show the theatre department is putting on. I brought the cookies with me because I figured they would be a good way to break the ice with my cast. They are all people I know due to the fact that we are all theatre people but I don’t necessarily hang out with. Now, though, I am required to get to know them because we are all playing a family in this show. I went from this fitting to my theatre class. I walked in and said flat out “Who wants free cookies?” Taylor Clemens was the first person to answer. “I feel like…this is a trap,” he said giving me his signature side eye he uses to intimidate every person who ever tries to act in one of his shows. Class continued as normal from there until Taylor, finishing his bag states “Damn these little poisoned cookies are good.” At this Maddie who was also in the class asked, half jokingly, “can I have another one?” Because I was ready to get done with this assignment I tossed her another bag. She did not expect me to actually give her more, so when I tossed the cookies across the room she let out the most elated squeak followed by “OMG COOKIES! !” Maddie was probably the most appreciative of the cookies. I now had only three bags of cookies left. I tried giving some away by putting a sign on my door that said “knock for free cookies” but no one knocked. After the fitting I went back to my room quickly to put the box away before going to work and was quickly grabbing some stuff out of my room with the door open, something I never do because I don’t want people who live on my hall talking to me. As I was doing this though, the girl who lives across the hall, Cassy, came out and said “hi” as she walked past. I figured I should get an actual strangers reaction so I called after her “do you want some cookies?” She turned on her heels and pulled her sunglasses down suspiciously to give me one of those over the glasses looks that you expect from angry teachers. She looked at me like this until I said to her “no really, I have to give away cookies for a class I am in.” “Don’t have to tell me twice,” she said as I handed her the cookies and she went on her way. I was on my last box of cookies and it was now Friday. I was running out of different people to give the cookies to and then I remembered that I had a production team meeting for the November theatre show that day. Though I am on the production team and know most of the other members very well, the girl serving as our SM is someone I don’t really know. So I sat through the production meeting and as we were winding down I turned to Katelyn Stewart and said “do you want some cookies.” Thinking I was asking a hypothetical question she said “Yeah.” I then brought out a package and she started laughing. Overall people were a lot less interested in why I was giving them cookies than I thought they might be. Most of them were just here for cookies. I also learned that apparently I give off a shady enough vibe that I would poison people. “Witches do not believe in the devil.” “Jane,” a witch and a goddess worshipper, is setting out to dispel myths about witchcraft. “Jane” is your average woman. She goes to church and dresses like an accountant. You would never believe that “Jane” is a witch. The lead of this story is a series of quotes from Sally Dale’s deposition during a lawsuit against the orphanage. I think it works because it sets a dark scene. This person is telling of a gruesome murder and keeping her exact words really show how she wanted to get her wording exactly right to make this case stick. I think this works really well because you aren’t clicking on this story expecting a happy time. The use of quotes really pulled me in to the story because it gave it a sense of being real. These weren’t some over exaggerated stories. This actually happened to someone. In this article we are told the story of different public places that have implemented classical music as a means of security. The main characters in this article are the groups that the tactic is trying to repel (vandals, homeless, etc.) and those implementing it (store owners, transit workers, etc). This story is written in a style that closely resembles a news story. There are a lot of quotes and scene building that make it more of a feature, but for the most part the facts are presented in a reporting style. What is really interesting is that this story takes a turn. About halfway through, after reporting all the facts on this topic, the story gets very critical of the use of classical music in this context and how it really doesn’t do much in the deterrence of real crime. It simply moves it elsewhere. It also addresses the fact that weaponizing this music also adds to the reputation classical music already had for being elitist and only for those of a higher class. This is literally using the music to run off the lower classes. There are a lot of themes being explored in this article such as classism and safety as well as being a look in to connotations that music can have.